I have another one of the Fairytale Forest polishes by Pure Ice to show you today. This is their newest collection I happened to come across at Walmart for winter. To be quite frank, it's the first drugstore level polish collection I've been excited about in a very long time. I love this purple shade and I think you all will like it too. 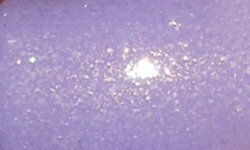 Tales Untold is a lavender creme with micro fine iridescent golden shimmer. Color: I love lavender polish. Soft purples are my favorite colors to wear in spring, but I'll wear them in winter too! What makes this polish is that beautiful golden iridescent shimmer. The shimmer really brings this polish to life without being overwhelming or harsh. This is stunning! Formula: This had a nice formula. I don't have complaints. I thought this formula was better than True Love's Kiss. It is a bit streaky on the first coat, but it was fully opaque in 3 coats. Price: This is $1.97 at Walmart. Overall: I can't get over the $1.97 price tag on this polish. It seems though, long gone are the days of beautiful polish being under $5 much less under $8. This is a stunning polish for under $2! I love this beautiful shimmer and the formula isn't anything to complain about. This is a definite contender for my Top 25 of 2015. Did I mention that is only a few weeks away!